When Europe agreed to open its borders to Syrian refugees in response to one of the greatest humanitarian crises of our age, officials assured the Western world: we've got this. There will be no jihadists among them; and if there are, we'll be sure they won't get in. But it wasn't exactly true. Jihadists, we now know, have been among them. They have gotten through. And now those same officials are starting to admit things might get even worse. On Saturday, only weeks after Germany's national security agency confessed it had been alerted to the presence of jihadists who posed as asylum-seekers, German police arrested three Syrians on charges of planning a major attack in Dusseldorf. The arrests followed a confession by a fourth suspect, arrested earlier in France, who had informed officials there about the plot. All four suspects, reported the Washington Post, had traveled to Europe along the well-worn, so-called Balkan Route. Prosecutors say the attack aimed to kill "as many bystanders as possible with guns and other explosives," as had a plot foiled days earlier in Antwerp. Europeans already are on edge as a result of the multiple terrorist attacks in Paris and Brussels over the past 18 months. But news of these arrests, coupled with heightened concerns among German intelligence officials, alarmed communities both in Germany and in neighboring countries. Yet despite this development, intelligence officials in the Netherlands, which shares a border with Germany, maintained until just last week that there is minimal chance that any asylum seeker there is a terrorist. That changed suddenly on Tuesday, with the disclosure by the same French suspect that the militants arrested in Dusseldorf had been part of a group of 20, divided between asylum centers there and in the Dutch city of Nijmegen. Not that this should be a surprise. Since the beginning of the crisis, Holland's screening of migrants has been sloppy. A report released in May by Holland's Ministry of Security and Justice noted that several screening centers were careless and inadequate, failing to meet established standards. Perhaps as a result of hastened procedural demands as the stream of refugees has increased, neither computer systems nor inspectors seems prepared to meet the challenges: as Dutch daily the Telegraaf observed, the system for checking fingerprints crashes daily; document screeners fail several times a week; and "it is unclear whether all baggage of the asylum-seekers is being properly inspected." Moreover, documents are rarely examined for authenticity – a risky oversight given the huge ISIS-based industry in falsified Syrian passports, a business which, in turn, helps fill Islamic State coffers. Indeed, one of the Paris bombers used such a passport to enter Europe, leading the former French intelligent chief to remark, "It's obvious now: amongst the migrants, there are terrorists." These problems are not limited to Europe. In Canada, a $16 million effort to screen refugees was recently termed an "expensive security flop." An internal evaluation of the effort, CBC News reported, determined that "the screening project delivered information too late, strayed beyond its mandate, and in the end did almost nothing to catch refugees who might be linked to criminal or terrorist groups." Such errors have not gone unnoticed by American intelligence. As early as November 2015, a Homeland Security report called Europe's open borders a "cause célèbre for jihadists" and described Europe's asylum and refugee screening processes as "rife with security holes." "Foreign officials in Western Europe ... said that already some asylum seekers had been identified as having potential terrorism ties," the report notes, "but by the time they were flagged the individuals had already left the area." As a result, "Europe's 26-country Schengen area is ground zero for the continent's terrorist travel woes." True, the United States enjoys elements of security that Europe does not. 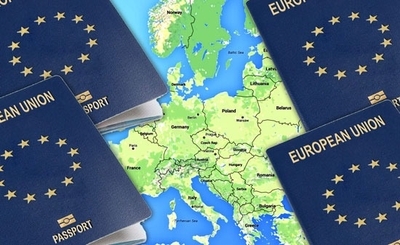 While nationals and citizens of EU countries can travel to the U.S. visa-free, those who are also nationals or citizens of Syria, Iraq, Iran, or the Sudan can not. And all foreign visitors are required to register with the Homeland Security Department's Electronic System for Travel Authorization (ESTA) prior to arrival. Still, even with such measures in place, the Homeland Security report recommended a temporary suspension of the Syrian refugee program in the U.S. "until the nation's leading intelligence and law enforcement agencies can certify the refugee screening process is adequate to detect individuals with terrorist ties." In January, however, Democratic senators blocked a bill that would do just that. Now the country faces a crossroads. In the first half of 2016, only a fraction of the 9,000 refugees America agreed to take in this year had actually been accepted, in part, NBC News reported, because "a lack of preparedness for the sudden increase in refugee applicants and resources to vet them has led to backlogs in the process." To rectify the situation, "the administration has begun to ramp up operations, both at home and abroad, to review a greater volume of refugee applicants and stay on track to meet its commitments." Since then, the number of refugees approved for resettlement has increased markedly, to almost 5,000. But at least as important as its commitments to refugees is America's commitment to the safety and security of its own people. And if Europe's example is anything to judge by – and Homeland Security agents seem to believe it is – then "ramping up operations" likely will put the country at an increased risk of terrorism. After all, if the U.S. suffered a "lack of preparedness and resources to vet" the refugees until now, it is hard to imagine that speeding the procedure would in any way benefit the nation's security. And "haste," as a Moroccan proverb says, "is the sister of repentance." We save no one, not even the refugees, from danger, if we only increase our own. Officials claimed they had got it?!
" officials assured the Western world: we've got this. There will be no jihadists among them;"
Funnily enough I don't remember any official saying anything remotely like that, but perhaps the U.K. media did not report it being far to busy hysterically emoting over the plight of the "poor starving destitute refugees". A. poor - most seemed to have the latest iphone and nice jeans, had paid $1000s for their passage does not seem to suggest abject poverty. C. destitute - see A and the truly destitute are unlikely to have baggage that is a "challenge" to inspect. Anyone in the U.K. who suggested that maybe ISIL terrorists were amongst them because ISIL had stated it would infiltrate "4000 mujahideen" was drowned out by the reportage at best or howled down as an Islamophobic, racist bigot at worst. So my response to the notion that "officialdom" even recognised the possibility, never mind the inevitability of Jihadist infiltration (as proven by information coming to light after Paris/Brussels) is "I wish!". Last month Germany had over 74,000 criminal acts by refugees. Last month Europe suffered over 1000 rapes by refugees. 75% of the refugees are men. Slavic countries won't take them. Many countries deporting them in huge numbers now. Britain thinking of leaving the EU. Europeans are fighting back, burning out Muslims and Americans are sick of Obama and the Left.